I first saw this mounting position in an AAR for a rifle point shooting class given by Roger Phillips out of Las Vegas. 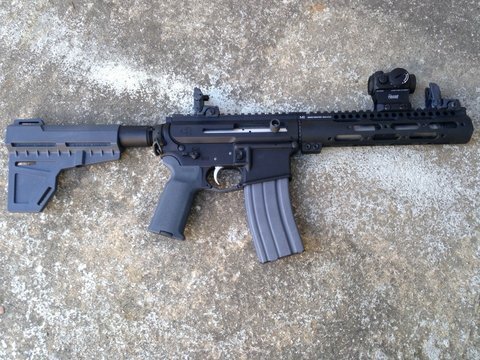 I was intrigued, and decided to experiment with it a little for cqb shooting out to 25 yards...and I love it. I'm not convinced it would work as well with anything other than the T-1, but it's really accelerated my time on target from ready positions and moving from target to target. The T-1's design in this position acts much the same way as the EOTech design...a giant frame...but in this case acting as a front sight, and it's light, so floating it out there is no problem for handling. No searching for the dot. As you raise or transition, you use the tube as a sighting device over center mass for the first shot, giving the eye time to locate the dot for follow ups and precision. It's fantastic! If you have time for precision on the first shot, you use as normal. Eye relief isn't an issue, so there are no drawbacks I've found yet. Because I'm running such a short barrel (300BLK), adjusting brightness isn't even a problem, though I typically use only two settings anyway, depending on lighting conditions. Anyway, this has been a game changer for me, and I'll be moving this optic to my Vector next week when I get it...mounted forward. 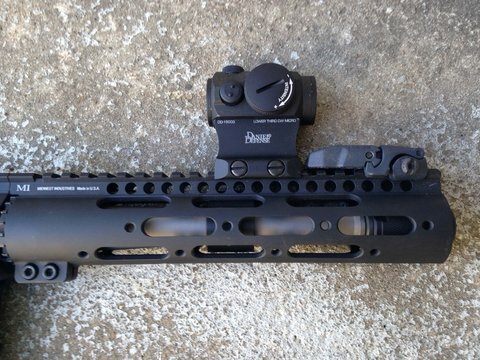 The AR will be getting a Trijicon Accupower 1-4 with a bobro mount. I just though some of you may find this useful and worth trying, considering the optimal ranges for an SMG platform like the Vector. Interesting stuff and thanks for sharing!